What: The weather has been great, so you’ve been walking every morning before work. After the first few weeks you lost a few pounds of fat and were even able to fit into some shorts from last summer (no small feat!). But now the same walk doesn’t seem to do as much as it did six weeks ago. The scale hasn’t moved in a couple of weeks and those summer shorts you were able to get into are now starting to feel tight in the waist. Why: While your body loves to exercise, it gets bored pretty easily (you thought it was just your mind!). You need to keep changing your workout to keep change happening in your body. It appears that most exercisers need to change their workout every three weeks to make sure their body keeps changing. Keep in mind that you don’t need to completely dump your whole routine in lieu of a new one; you just need to change it about 25 to 50%. 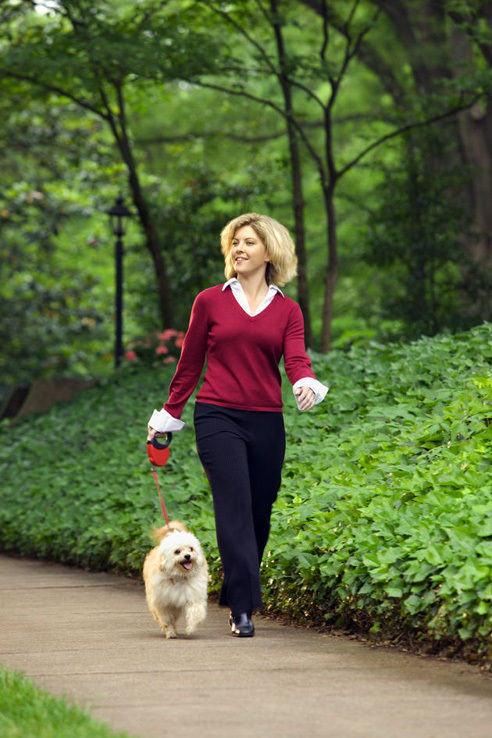 If you normally walk a completely flat three miles, add in a few hills, increase your speed or walk a bit farther. If you can’t change your walking or biking route, add in interval training. Interval training is simply walking or biking a bit harder for an interval and then slowing down for the next interval. Start with 1-2 minutes, and then go back down to your normal pace for the same amount of time. A good way to do this while walking in a neighborhood is to walk faster for five or six houses and then slow down a bit for five or six houses. Add in some strength work. Adding strength work will do wonders for your fat burning. A pound of muscle will burn an extra eighty calories a day compared to fat that burns about two calories a day. Try adding in some lunges at the end of your walk or do some push ups on your kitchen counter top. Add in a totally different type of cardiovascular workout. Sometimes your body just needs a complete change to “get over” a weight loss plateau. Try an exercise video/DVD at home or a class at a community center or health club. I have found that most community colleges offer well taught and reasonably priced fitness classes during the summer. Gardening is a workout! So is playing with kids or grandkids, but to make either of these into a workout, you will have to keep moving, stay in motion and stay off the couch!